The menacingly beautiful blue coral snake preys on other fast moving, venomous snakes. To immobilize its prey, this reptile employs a particularly nasty venom—one that makes the last moments of the victim’s life a living hell. One quick look at this reptile and it’s clear this thing means business. 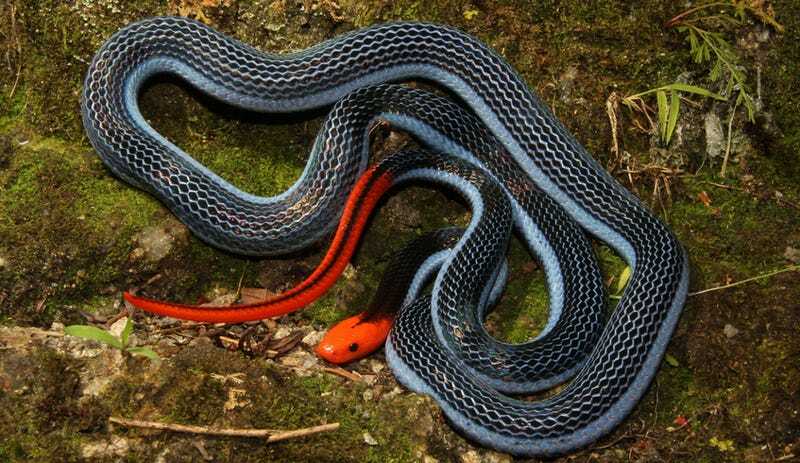 Found in southeast Asia, the blue coral snake (Calliophis bivirgatus) features a striking neon red head and tail, and electric blue stripes that run down the length of its body. In a new paper published in the science journal Toxins, researchers from the University of Queensland and several other institutions describe this creature’s unique and deadly venom—a poison that delivers a massive shock to a prey animal’s physiological system. Almost immediately after being bitten, the victim enters into an agonizing catatonic state, with its muscles stuck at full flex. The venom causes all nerves in the body to fire simultaneously, triggering full body spasms. Paralyzed and helpless, the animal is eventually put out of its misery by the killer snake. It’s nasty business, but evolution has equipped the blue coral snake with this particularly powerful venom for a reason. This highly specialized predator likes to hunt other venomous snakes, which are typically very fast and also exceptionally dangerous. The venom is produced and stored in a gland that extends for one quarter of the snake’s body length. Scientists have seen this kind of toxin before, but never in a snake, let alone any other vertebrate species. Some animals, like some scorpions and spiders, have evolved similar toxins. The cone snail, for example, injects a similar kind of toxin into fish, causing them to go into an instant paralysis, where they fully tense their muscles in a tetanus-like spasm. The blue coral snake’s venom does practically the same thing, and scientists say it’s a good example of convergent evolution (where a similar trait emerges independently in different species). Once administered into the body, the toxin causes all the nerves within an animal’s body to switch on simultaneously, causing the prey animal to enter into a frozen state. The researchers refer to this state as spastic paralysis, as opposed to the flaccid paralysis induced by other snake venom. The compounds within the venom prevent the nerves from turning off their sodium channels, which results in the nerve firing continuously. It’s like pressing the nerve’s accelerator pedal to the floor, and then cutting off the brakes. Ironically enough, this venom—dubbed Calliotoxin—could be used in pharmacology to develop new medicines. Scientists are now particularly interested in its ability to act as a painkiller in humans. George is a contributing editor at Gizmodo and io9.